One thing about the Canadian Air Force; they like their colorful display planes. This particular one is from 1992 and is the VU-32 offering to the mix. It is called the 'Silver Shark' and is painted in a most unusual set of colors. The modeler is going to have to go back to the olden days on this one and mix both the upper and lower surface colors to match the two decal swatches offered on the sheet. Now you will probably not be able to even see the underside color on the sheet as it blends in nearly perfectly with the background of the sheet and nothing I could do would bring it to the forefront. You'll just have to trust me that what looks like blank areas on the sheet are actually full of decals! This set is offered in both 1/72 and 1/48, and other than size, they are identical. For kits, the only real choice in 1/48 is the Hobbycraft kit, though some may want to resurrect their old Testors/Hawk versions. In 1/72, the choice is between Heller and Hasegawa. Most will go for the Heller kit as it is the most accurate. Both are well near 30 years old or more and this wouldn't be a bad choice for Academy to do one of its upgrades to a more modern standard. 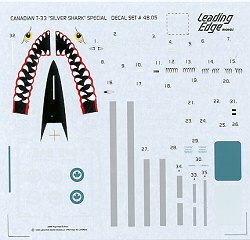 You should know by now that Leading Edge has the finest instruction sheets around so there will be no problem figuring out what decal goes where. 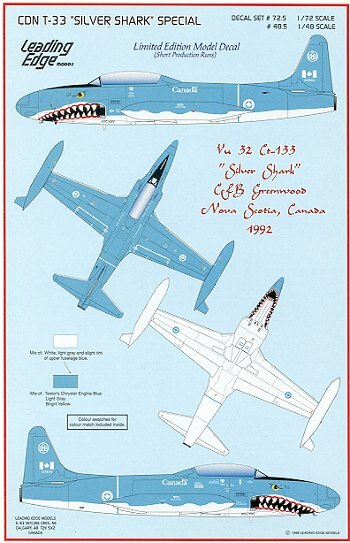 In all, another superb effort and one that will really trick out your next T-33 model. If you would like your product reviewed fairly and quickly by a site that has well over 250,000 visitors a month, please contact me or see other details in the Note to Contributors.